With Dementia affecting 1 in 14 people in our community, East Cheshire Hospice is proud to play its part. You can help us to deliver amazing care that helps with person with early stage dementia, and their carer too. A volunteer is matched up with a person, based on shared interests so they can enjoy shared interests, whilst giving their carer a few hours break, during which time they could get their hair done, meet friends, take exercise, or whatever suits them. This can take place any time during the day and we ask the volunteer to commit to a couple of hours, once a week or fortnight. No personal care is involved, and full support will be given to you throughout training and volunteering, so you can concentrate on enjoying making a real difference to the life of the person and their carer. You don’t need to have had any previous experience of working with people with dementia – a caring nature and a willingness to learn are our only requirements! Can you make the Hospice a more beautiful place? 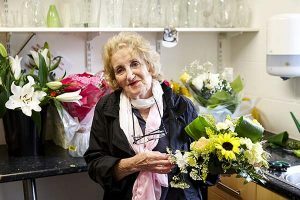 Creating and refreshing all flower arrangements and donations of flowers throughout the Hospice provides a wonderful service for our patients, families and staff to enjoy, making the Hospice as welcoming as possible. This will be perfect for people who have a couple of hours to spare once or twice a month and would enjoy creating a nice environment for our patients. An interest in flowers is preferable, but, you don’t need to be a florist! If you are interested then please email medge@echospice.org.uk or complete and application form. Can you help in our shops? We have three charity shops and often our customers have personal ties to the Hospice and they may have a story behind their donations. It’s sociable work at the heart of our community and our retail volunteers act as ambassadors for the Hospice, extending the caring ethos of the Hospice to them in taking the time to listen to their experiences, but it goes without saying that working as a vital part of our retail team, you will be helping to raise the £7,500 per day we need to deliver the highest quality of care to our patients and their loved ones. If you’d like to find out more about how you can support our customers and help to fund the care we deliver then please e-mail: hsmith@echospice.org.uk, apply using the application form below or pop into any of our shops where you can have chat with the manager or a volunteer and we can arrange for you to play shop for an hour. East Cheshire Hospice has three shops, and we are particularly looking to recruit on Fridays and Saturdays in our Thornton Square shop, and on Sundays and Fridays in our Handforth shop. Here our volunteers receive donations, sort, price and display goods given to us by supporters in our community. We are not currently taking any applications for work experience, except for in our retail department where we welcome applicants including schools, work experience programmes and Duke of Edinburgh. If you’d like to do work experience in our shops, please complete an application form. Work experience applications open in December 2018.